Where is middle C on the piano or keyboard? From all the C’s on the piano, there’s only one that is the middle C. The middle C is, as you guessed already, a C that doesn’t sound (very) low nor (very) high. It sounds, well, in the middle… But where is middle C on a piano or keyboard? That depends on the piano or keyboard, as we will see later. In the next sound sample, you can hear a middle C so you can compare it to the middle C on your piano or keyboard. Where is the middle C? The location of the middle C on a piano or keyboard depends on the number of keys that your instrument has. An acoustic piano normally has 88 keys. An electronic keyboard however has not necessarily always 88 keys. There are keyboards with 76, 73, 61 or 54 keys, and even other numbers of keys exist. As a general rule: the middle C is the C that is nearest to the exact middle of the keyboard. Let me illustrate this with some keyboard-examples. To find the middle C on an 88 key piano or keyboard, look for the exact middle of the keyboard. Since the keyboard has 88 keys, this is between key 44 and 45 (red arrow in figure). The middle C (highlighted in blue) is the C nearest to the exact middle of the piano. On an 88 key piano or keyboard, the middle C is the 4th C from the left of the keyboard. The exact middle of a 76 key piano is showed in the next figure. In the same figure, the middle C –which is the C nearest to the middle of the keyboard- is also indicated. As mentioned above, the general rule states: the middle C is the C that is nearest to the exact middle of the keyboard. And, to be honest, it’s normally not even necessary to count the number of keys, divide by 2, look for the nearest C, etcetera: with a little bit of feeling, you can see at a glance which C is the middle C.
Please tell us what you think of this lesson by leaving a comment below. You can make an inversion of this perfect 5th interval by either taking the highest note and move it an octave down, or by taking the lowest note and move it an octave up. In the keyboard below, you see the highest note that was moved an octave down. 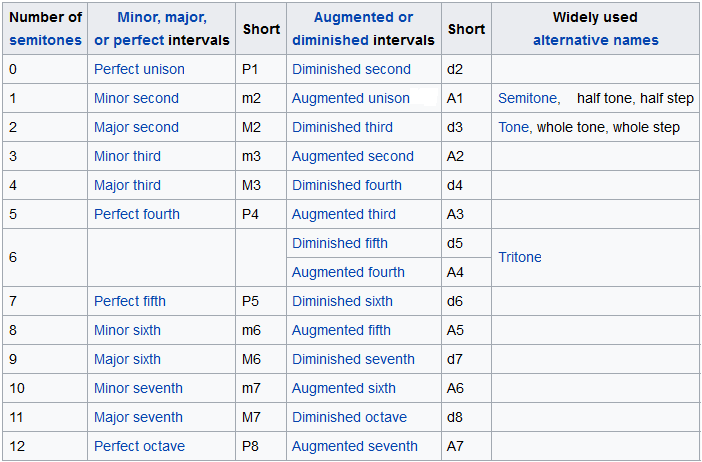 Whether you move the highest note an octave down, or the lowest note an octave up, the result is the same: the inversion of the perfect 5th interval from C to G is a perfect 4th interval from G to C.
So, a perfect 4th interval is the inversion of a perfect 5th interval. The reverse is also true: a perfect 5th interval is the inversion of a perfect 4th interval. Together they add up to an octave, because a perfect 5th (7 semitones) plus a perfect 4th (5 semitones) make together 12 semitones, an octave. You can also see it the following way: when you want to go from C to G, you can either go up a 5th, or go down a 4th. Now, this is not only true for the ‘perfect 5th-perfect 4th pair’. Other pairs of intervals exist that act the same way. In fact, every interval has its inversion. For example, the inversion of the major 3rd interval from –let’s say- E to G# is the minor 6th interval from G# to E. Also here, the intervals add up to an octave, because 4 semitones (major 3rd) plus 8 semitones (minor 6th) equals 12 semitones (an octave). A special case is the tritone interval. The tritone doesn’t need a partner, it just needs itself! A tritone splits an octave exactly in two equal parts, so a tritone just needs another tritone to make an octave. A tritone consists of 6 semitones, so: 6+6=12, an octave! Notice that a perfect interval always goes together with another perfect interval and a minor interval always goes together with a major interval (and, of course, vice versa). Please leave a comment below and tell us what you think of this lesson. When you play 2 different notes at the same time or one after the other, you will have a lower and a higher note. This means there is a distance (in pitch) between the 2 notes. This distance is called the interval between the 2 notes, the note interval, or simply interval. You can measure this intervals between notes in number of semitones, and this takes us directly to our first interval: the semitone. The easiest way to explain semitones is to look at the piano keyboard. A semitone is the interval from a key on the keyboard to the first note at the left or the right. So, for example, the interval from C to C# (or Db) in the next figure is a semitone. Notice that it’s not possible to have an interval of a semitone between 2 black keys on the piano. Other names for a semitone are: half tone or half step. The minor third is an interval of 3 semitones, or a whole tone and a half tone (semitone). The major third is an interval of 4 semitones, or 2 whole tones. The perfect fourth (very often simply called fourth) is an interval of 5 semitones (or 2 whole tones and a semitone). The tritone is an interval of 6 semitones or 3 whole tones (that’s why it’s called tritone, since ‘tri’ means three). 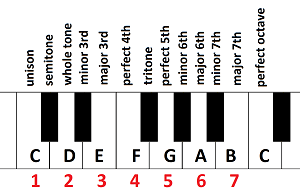 The perfect fifth (very often simply called fifth) is an interval of 7 semitones (or 3 whole tones and a semitone). The minor sixth interval consists of 8 semitones, or 4 whole tones. The major sixth interval consists of 9 semitones, or 4 whole tones and a half tone. The minor seventh is an interval of 10 semitones, or 5 whole tones. The major 7th is an interval of 11 semitones, or 5 whole tones and a half tone. The perfect octave (mostly just simply called octave) is an interval of 12 semitones, or 6 whole tones. Since there are 12 different notes in Western music, this means that when you go up an octave, you arrive at the same note. Well, it’s of course not exactly the same note, since it’s higher in pitch: an octave higher. We haven’t mentioned yet the simplest of all intervals: the perfect unison, mostly simply called unison. The unison is the interval between a note and itself, so 0 semitones. Now, that sounds a bit strange and it’s actually not really an interval in the real sense of the word. A note in a scale is often named after the interval it makes with the root note. What I mean is, for example when we are in the key of C, that the E is called the major 3rd, the Eb the minor 3rd, the F the 4th, the G the 5th, the A the 6th, the B the major 7th and the Bb the minor 7th. The 2nd note (D in the case of the key of C) however, is not called after its intervals with the root. You could call the 2nd note just the 2nd. The Db would then be the minor 2nd. There is however another name for the 2nd, I will talk about that in another lesson. There are still some more notes: the Gb is the flattened 5th (or short: the b5). F#, which is the same note, would be the sharpened 4th (#4). The Ab is a flattened 6 (b6). The same note, the G# is the sharpened (or augmented) 5th (#5). You will often see even other notes like the 9th, the 11th etcetera. I will treat those in another lesson. It’s very practical to be able to quickly recognize intervals. For that reason, I advice to do the exercises below. What are the music note names used in Western music? In Western music, we can distinguish 12 different notes. Every song or piece of music is made of only those 12 different notes. The easiest way to show the 12 notes is on a piano keyboard. On the keyboard, you can see a repetitive pattern of white and black keys. Those are exactly the 12 different notes in Western music we spoke of above. This might sound funny, but to find the names of the white keys, look first at the black keys: they come in groups of 2 black keys and 3 black keys. Just at the left of a group of 2 black keys you can find the note C.
To find the names of the other white keys, just go up alphabetically to G as in the next figure. Do you remember that we had to look at the black keys first to find the names of the white keys? Well, let’s reverse the roles now: to find the names of the black keys, we have to look at the white key names first, since the names of the black keys are derived from the white key names. As you can see, a black key is always situated between 2 white keys. The black key indicated by the arrow in the figure below is for example between the C and the D. As this note is higher than the C, but lower than the D (the pitch of the notes gets higher when you go from left to right), we call this note C sharp, or D flat. So, sharp means: the note just at the right, and flat means: the note just at the left. We write C sharp as C# and D flat as Db. So the black keys actually have 2 names, the name of the white key at the left with a sharp (#) sign, or the name of the white key at the right with a flat (b) sign. In the next figure, you can see all the names of the notes on a piano keyboard. As you can see, this is a pattern of 12 different notes (represented on the piano by 7 white keys and 5 black keys) that repeats itself. Btw, notice that on the right side of the B and on the right side of the E, there is no black key. So you could call the C also B#, and the F an E#. Or, in the same way, you could call the B a Cb and the E an Fb. In music theory, this is sometimes needed (the 7th note in the F# major scale is an E#, not an F, even if it is exactly the same note). It is even possible to have double flats (bb) or double sharps (##). For example, a C## is raised 2 times, so this is equivalent to a D. A shorter writing for double sharp looks a bit like an x (see figure below), so Cx would be the same note as C## or just simply D.
Two notes that are written differently, but that are actually one and the same note, are called enharmonic equivalent notes. C# and Db are for example enharmonic equivalent notes: they are written differently, but are the same note. After this lesson, you should be able to recognize the keys of the piano and know the names of the corresponding notes. In the beginning, you will probably not remember every note and every key on the piano, so just practice 5 minutes a day and you will see: in no time you will master it. The exercises that are accesible via the links below will certainly help you to practice the notes. Did you already know the note names and/or the corresponding keys on the piano? Did this lesson help you to learn the notes and keys on the piano? If so, please leave a comment below.